Miserable few days - head cold that won't go away, layer of dust throughout the house result of putting in laminate floors, brilliant idea for a native stone patio out front has evolved into a skating rink - need to re-direct the gutters. There's always something! Headed into Tucson for a few days to hang out with grandsons while the parents were away. Visit coincided with a hard freeze. October, when I leased my Tucson house for a year and made the trek up to the mountains, I moved a miniature Meyer lemon tree over to my daughter's house. Saturday, in anticipation of the big freeze, I stripped it and brought the haul of wonderful, juicy, fragrant lemons back up here with me. On a side note my daughter commented that "something has eaten all the lemons, do you think rabbits would do that?". With visions of Mama Rabbit daintily picking lemons floating in my head I came clean and confessed to being an *indian giver and "borrowing" back the lemons. 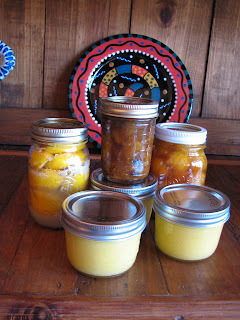 I promised her a share in the bounty by way of preserved lemons and lemon curd ... great hostess gifts or stocking stuffers. Preserved Lemons couldn't be easier to make. I use them in all sorts of dishes from polenta to sauteed spinach and of course Moroccan type tagines. 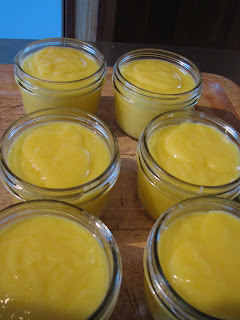 Sterilize whatever size jars you want to use. Place a tablespoon or so of sea salt or kosher salt in the bottom of the jar. Quarter the lemons to within about 1/4" to 1/2" of base and stuff the lemon with salt, place in the jar. Continue stuffing lemons until the jar is full. Press down to begin the juice extraction process and then squeeze in the juice of a couple more lemons. Cap the jar and keep in a warm dry place for a few days, turning frequently to aid in dissolution of the salt. If the lemons are not covered in liquid, add more lemon juice. Do NOT add water. Lemons will keep indefinitely in a cool dark pantry or refrigerator. 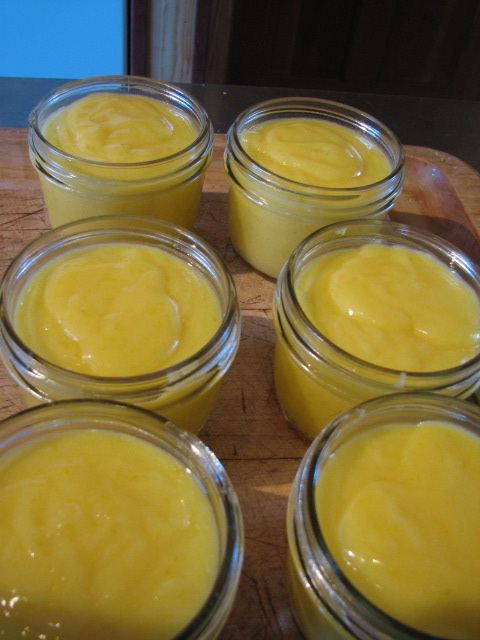 Lemon Curd : a lick-the-spoon childhood favorite, wonderful on toast, on scones, in tiny tart shells - uses are as good as your imagination. I like to make a lemon trifle around the holiday season that includes sponge cake sliced and sandwiched with lemon curd. The only tricky part about this recipe is the heating/cooking of the curd itself. You must use a double boiler (or improvise as I do with a curved stainless bowl set into a pan) and you must keep whisking while the curd is heating. The moment it's thickened and will coat a metal or wooden spoon, take it off the heat. If you over cook you'll have a mess of sweet, lemon flavored scrambled eggs to deal with! Makes 6 Cups so prepare number of jars according to size by sterilizing and drying. Enough ripe, glossy lemons to yield 2 or more tablespoons of very fine zest and 1 full cup of juice. Zest the lemons directly onto a piece of parchment paper. One of my favorite kitchen gadgets is a microplane zester. If you don't have one use the finest grater you have. Put the zest into the top part of your double boiler. Cut the butter into chunks. Add to the juice and zest along with pinch of salt. Put about 2" of water into the bottom part of the double boiler and bring to a brisk simmer. Beat the egg yolks and whole eggs in a large bowl until they are foamy. Gradually add the sugar beating continuously until the mixture pale, fluffy and thick. Place the top part of the boiler into the bottom half over the heat, immediately add the egg mixture and begin whisking vigorously. Keep whisking (will take about 10 minutes) until the mixture is steaming hot (but NOT boiling) and will coat a metal or wooden spoon. Immediately remove from the heat. Pour into the sterilized jars, cap and store in the refrigerator. Place peeled oranges in a sterilized canning jar. In a stainless saucepan bring all of the above to a boil, reduce heat and simmer for 10 minutes. Cool in the pan for 15 minutes. Strain, return clear syrup to clean pan, bring to the boil, pour over the oranges, pop the cinnamon stick in the jar, cap and seal tight once the lid pops and seals. I plan on holding these until the holidays and using them as a condiment with cold pressed beef. Might work- could be a disaster! The idea was to create a spiced syrup to offset the bitterness of the oranges and provide an interesting contrast in flavor. I added the pomegranate syrup for color - I think pomegranate seeds would be nice too. In my little still life of the jars there's also a jar of mango/pear chutney that I made a couple of weeks ago as I channeled my inner pioneer woman putting up for the winter! Happy to share that recipe if anyone is interested. 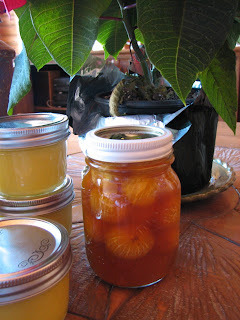 I still have some lemons left and I'm thinking Limoncello - stay tuned. *Indian giver - derived from the days when the white man gave things to the Native Americans and then took even more away from them. Bittersweet, heart wrenching and finally decided over a glass of Shiraz at our favorite "office" meeting place - El Charro at Ventana restaurant here in Tucson. Since way before the first edition came out in March 2007, Jenny and I labored over the format, design, logo, look, content, direction - the list goes on - for this new baby - Connections for Women. It has been a labor of love, we've given birth each month since to a vibrant, fact-filled, sometimes humorous, sometimes serious, issue of Connectionsforwomen. We've introduced some wonderful contributors in the ares of relationships, thank you Jim Duzak, Rosie Kuhn and Anne Perry. Home organization - what would we have done without Lorie Marrero and now Helene Segura. And on the home front in Nutrition - Julie Garden-Robinson has been more than a treasure trove of information. We've sweated, leaped, danced and raced up the stairs, pie-pan in hand with the loveliest, most gracious of fitness gurus one could hope to meet - Jenny Anchondo (still rooting for that DVD Jenny!) And we've traveled - even to Libya - we've cooked dinner with friends, we've discussed medical issues common to women, we've dished the dirt on good books. It's been a great journey. All good things come to an end and years in business have taught the founders of Connections For Women that recognizing that time is crucial to growth. Successful entrepreneurs know when it is time to let go of the baby and hand over. So with very mixed feelings bordering on sadness and excitement, we know that it is time for new blood at Connectionsforwomen.com and all of its connecting community sites. To this end we are looking for an individual, individuals, couple, couples, complimentary communities already established or just getting started to take over and infuse the vision of Connections for Women with new energy taking it to the next level.